Seitan, you’re so bad, you’re good. It’s been awhile since I’ve had a jibarito sandwich, and since I am on a seitan kick, I decided to fry something up. Sandwiched between two golden slices of fried plantain were two layers of lightly salted, sizzling seitan, fresh tomatoes, and garlic + herb lemonaise. Lettuce is typically thrown in this sandwich, but I was opting out of the greens today. Can’t even tell you how perfect this was! It definitely satisfied the salt and meat craving I was having. It’s super easy and fast to make! Peel plantain. Cut in half, then cut diagonally. Fry plantain in medium-high heat until golden on both sides. Remove plantains from oil. Set it on paper towels. 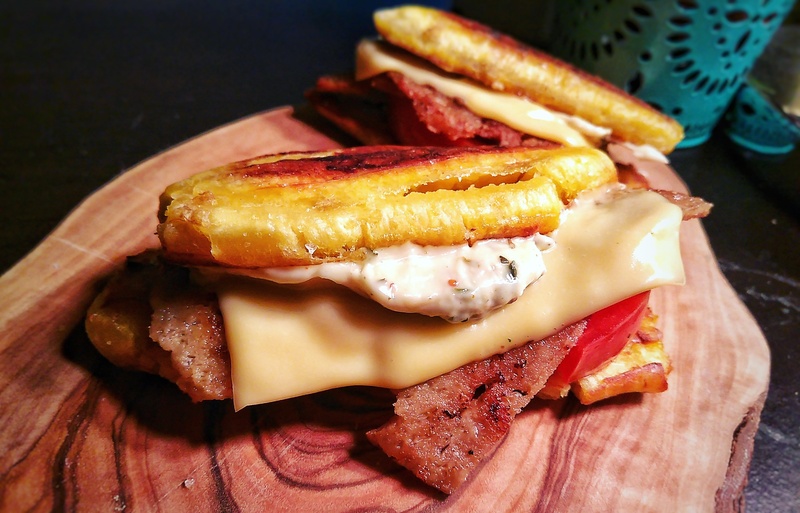 Place plantains between two cutting boards and apply pressure to flatten. Re-fry plantains for 1 minute on each side. Fry seitan and add salt + pepper while frying. Fry seitan for about 2 minutes, or until golden (use the same pan). Assemble sandwich: Add the mayo, sietan, tomatoes, lettuce, and cheese (optional).